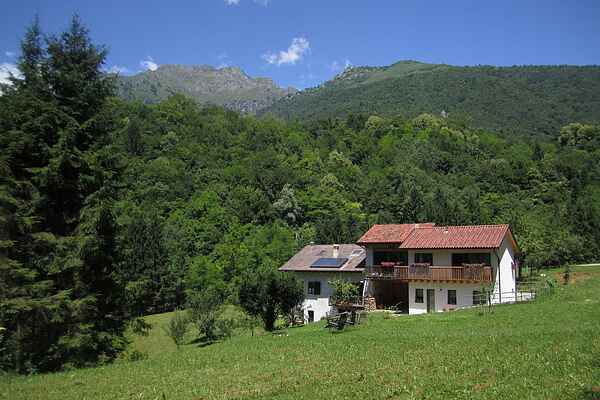 An attractive holiday home, close to Feltre. This holiday home is a farm building, which has undergone full renovation works, with respect for local style and building materials. It is located in a large park with woodlands and a creek in which one can swim. It is the perfect place for fans of nature and boasts light and airy bedrooms, a 28m2 porch and plenty of outside space in which to relax. The building is divided into three units, one of which is inhabited by the owner. The garden and the large park, (2 hectares) are used by the owner and guests alike. Please note: A maximum of 1 dog is permitted as a pet (no: cats, birds, etc. Etc.) Just a stone’s throw away is the beautiful, medieval town of Feltre, where you will find lots of shops, services and restaurants. This holiday home is located in a central position, both for mountain fans (The Dolomites) and those who love the Veneto region’s art cities. Beautiful holiday home, near Feltre. This holiday home is a cottage completely renovated by style and materials of the area. It is located in a large park with woods and stream where bathing is permitted. It's so ideal for nature lovers. The bedrooms are spacious, ventilated and sun- drenched. There is a terrace (porch) of 28mq and there is plenty of room outside to relax. This building consists of several houses, one of which the owner lives. The garden and the park (2 hectares) is used by howner and customers. Feltre, a beautiful medieval town, is not far from here. In Feltre you can find many shops, services and restaurants. This house is centrally located for lovers the mountains (Dolomites) than for the cities of art in Veneto. The interesting surrounding area: Padua (a historical university town rich in culture, with works by Giotto), Vicenza (architecture and the Palladio villas), Venice (cultural, political and moral capital of the Veneto region, as well as a spectacular place to visit), Sottomarina, Jesolo, Caorle (sea and beach), Verona (Arena, Romeo and Juliette) and Lake Garda (beaches, surfing and amusement parks).